ARP Seal Plate & Cam Drive - Excelerate Performance - European, Exotic and Japanese Performance Specialists!! If the survivability of your camshaft drive, through an entire race without stripping or breaking, has been a matter of concern – ARP’s new cam drive should put your mind to rest. We built this setup to be “bulletproof.” Totally reliable. 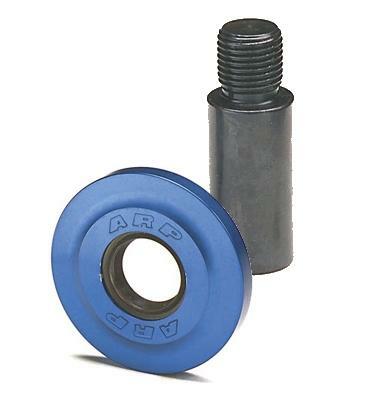 A through-hardened, not just case hardened, chrome moly shaft, premium grade Viton seal, plus anodized aluminum plate are manufactured in-house to insure that every part is guaranteed ARP quality. The perfect compliment to our “bulletproof” cam drives are these precision seal plates. They’re made of CNC-machined 7075-T4 alloy aluminum and anodized to resist corrosion. Available in 2.100˝ and 2.380˝ diameters to fit most any OEM or aftermarket block. Drive: forged ARP2000, 220,000 psi alloy chrome moly steel with corrosion-resistant oxide finish.